French President François Hollande said yesterday that his government will provide intelligence and equipment to the Multinational Joint Task Force (MJTF) to help in prosecuting its ongoing war against terror in Nigeria and the African sub region. Hollande, who stated this after a closed-door meeting with President Muhammadu Buhari, expressed his government’s concern about the insecurity in Nigeria and in the entire West Africa. On what he discussed with President Buhari during the meeting, Hollande said they addressed issues bordering on new strategies of partnership that would enable Nigeria and its neighboring countries of Cameroun, Chad, Niger and Benin Republic fight the insurgency and restore peace. He noted that as a part of the intervention to assist in the fight, France last year hosted a regional summit on security in Paris which brought together the neighbouring countries to chart the way forward. “We’ll provide all of the support to the countries in the region which are affected by this cult and in Nigeria; we want to provide support and solidarity,” the French president stated. He applauded President Buhari’s effort in containing the Boko Haram insurgency, particularly the movement of the military command centre to Maiduguri which has helped in reenergizing the fight against Islamists. Hollande hinted that France had concluded plans to invest a total of €130million in the development of infrastructure in Nigeria for the rebuilding of roads, provision of electricity and water supply. He said despite the fall in the price of crude oil in the international market which has affected Nigerian expected revenue, the country’s economy remains strong. 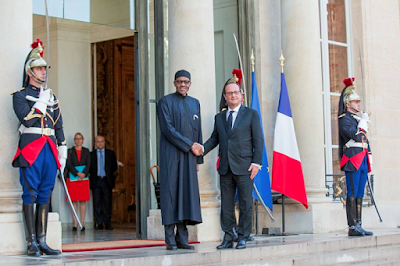 “The Nigerian economy remains strong, so France wants to be doing business in the country”, Hollande said, adding that France was planning to increase the visibility of its investors in Nigeria. On his part, President Buhari praised the French government for assisting Nigeria, even as he said his administration was ready to partner with France for the overall development of the country. The Nigerian president observed that with commitment from France, Nigeria’s next shopping list regarding support will move to other members of the G7. He said, “We have to depend on France and the other G7 countries for support to fight piracy. Our next shopping list is going to G7in terms of intelligence and training. On Nigeria’s problems, Buhari added that more than 67 percent of the youths were unemployed, a situation which, he said, was of great concern to his administration. He said, “We are finding the best way in agriculture and mining to address this before sophisticated infrastructure and security are provided. We want to make sure we feed ourselves and provide security before other things are also tackled. “That is why we focus on agriculture and mining before other infrastructure, including electricity, is tackled”. The president will today continue with the visit and hold talks with the business community in France, in his determination to open the frontiers of investment in Nigeria. Nigeria and France last year signed bilateral agreements which enabled the French government to provide $1.170m soft loan through the French development agency, AFD, for the construction of high voltage power lines and substations that will connect Abuja with electrical distribution networks. President Buhari is expected back in Abuja tomorrow.